Size Height 300 mm, width 210 mm. Watermark Crown, form 1. Drake's identification: Watermark type C18. Drake's description: Missing in his table, probably equal to 18, Mountains 16 X 16mm. 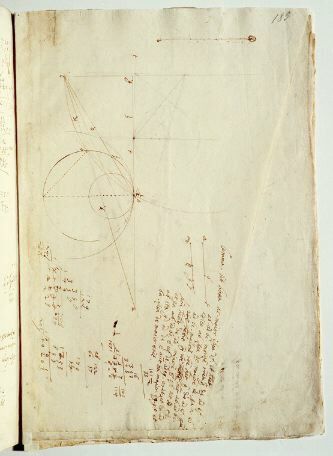 Comments Written by Galileo; contains drawings, text, calculations. Relation to the Discorsi: draft of 2/35-pr-14-lemma-2; work on 2/36-th-22. 1 Lemma. Sit linea ac maior ipsa df, et habeat ab ad bc maiorem rationem quam de ad ef: dico, ab ipsa de maiorem esse. Quia enim ab ad bc maiorem rationem habet quam de ad ef; quam rationem habet ab ad bc, hanc habebit de ad minorem quam ef. Sit eg, et quia ab ad bc est ut de ad eg, erit ut ca ad ab, ita gd ad de: est autem ca maior dg: ergo et ba ipsa de maior erit.